Earlier this month, 1 Million for Work Flexibility had a series of meetings in Washington, D.C. 1MFWF Founder Sara Sutton was a panelist at Mental Health America’s Annual Conference where she spoke about workplace wellness and flexibility, and in addition, we discussed flex from a variety of angles with leaders at New America, the Office of Innovation and Entrepreneurship at the U.S. Department of Commerce, and the Office of Public Engagement at the White House. We’re excited to connect with all of these groups and to continue to build momentum towards positive change. The trip to D.C. was also a particular milestone for 1MFWF: Our Founder, Sara Sutton, and I (1MFWF Director) met for the first time in person! From her home-base in Colorado, Sara originally hired me sight-unseen to work remotely from my home in Connecticut, and in the two years since, all of our interaction has been conducted virtually. We build our 1MFWF partner relationships the same way, communicating regularly with our coaliton of 70-plus organizations over email, phone, and social media. And our outreach to the 1MFWF community takes place through our blog, online events, newsletters, and social media as well. What better way to advocate for work flexibility than to walk the walk? But we also know that there’s great value in spending time face-to-face, when it’s feasible and makes business sense. So while our D.C. visit was an exciting opportunity for Sara and me to officially meet, it was also the perfect way to connect in person with other work flexibility advocates. In addition, we met our communications consultant Melanie Kaye for the first time. Melanie came to us from her previous position as Communications Director for Dr. Jill Biden at the White House, and has been working with us—virtually as well—for nearly a year to help elevate the voice of 1MFWF. On my end, the trip to D.C. was a milestone on a personal note as well, as it was my last long-distance journey for a little while. I’m delighted to share that I am pregnant, and due at the end of June (any day!). As a first-time-mom-to-be, I know I will be seeing the issue of work flexibility from a whole new perspective. While I’m out of the office this summer, Sara and I are thrilled that Melanie will be filling in for me. Please look out for blog posts and other updates from Melanie over the next few months. Another example of work flexibility in action! Melanie Kaye is a communications strategist, writer, and former Director of Communications to Dr. Jill Biden. Before that, Melanie was a vice president at GMMB, where she helped create real and lasting change through advocacy and communications for a variety of progressive issues and clients. A Wisconsin native, she also served as press secretary to former Governor Jim Doyle. She is a co-author of The Complete Idiot’s Guide to American Government and was a reporter covering politics and government for The Hill newspaper in Washington, D.C., The Green Bay News-Chronicle, and the political news service WisPolitics.com. She lives in Silver Spring, Md., with her husband and two daughters. Follow her on Twitter @mfonderkaye. photo credit: 1MFWF. 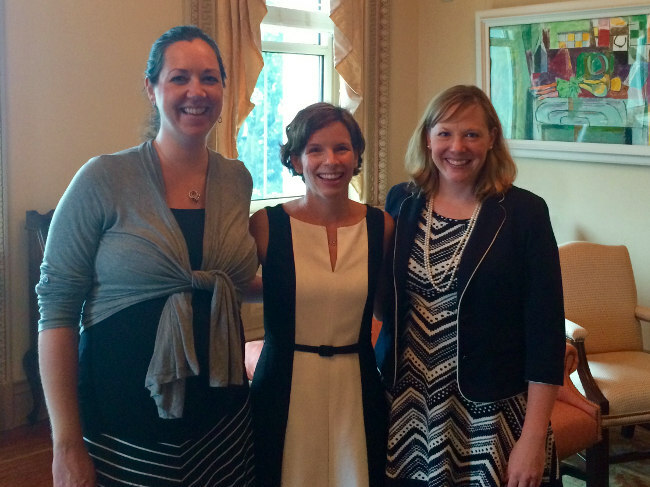 Emma Plumb, Sara Sutton, and Melanie Kaye (l-r) in the Eisenhower Executive Office Building.